We have our own Specialist and Minor Works (Small Works) department, managed by Keith Dawes who has over 20 years’ management experience within the industry specialising in the healthcare, commercial and conservation.projects. Our dedicated team are highly experienced in fast-track refurbishments and can deliver on low value projects and maintenance works up to projects of £500k. We pride ourselves on being flexible and in this special department we’re able to be very reactive to our clients’ needs. 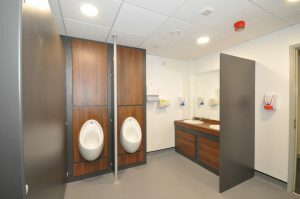 We have carried out a number of fast-track refurbishments and projects for the ABMU health board and understand the pressures of working within a live medical environment (including the potential problems which can occur and how they can be overcome). We offer value engineering, cost savings, design and delivery solutions and pride ourselves in understanding our clients’ needs – it’s all part of the John Weaver way of working. We currently have excellent working relationships with clients in the retail, educational, healthcare, and public sectors, including local authorities, and have carried out specialist works on prestigious conservation projects.